Many types of complex rolls consist of cream cheese and different types of fish. To get a real Japanese dish, it is important to choose the right kind of cheese to choose and buy the fish. Rolls, the national dish of Japanese cuisine, has become so widespread in Russia that many of them cook at home yourself. If in Japan the most popular traditional rolls – thin, with one ingredient in the composition, is covered with a sheet of nori, we have successfully used invented in USA brand rolls, for example, Philadelphia or California. They consist of several ingredients – this can be fish, seafood, vegetables, mayonnaise, soft cheese. For example, Philadelphia includes cream cheese and a strip of salmon, optional added pieces of cucumber, avocado, eel, caviar. To prepare this delicacy at home is harder than traditional simple rolls, but it is possible, if you pick a good, fresh and quality ingredients. What cheese to choose for cooking rolls? Traditionally for the preparation of Philadelphia or other rolls with a similar recipe using cheese of the same name by the American company Kraft foods is a soft creamy mass, is made from milk and cream. But for sushi at home is not necessarily strictly follow the original recipe used real cheese "Philadelphia" are hard to find, as a rule, it is sold in major supermarkets and has a high price. But it is possible to replace it and take advantage of its counterparts – the creamy cheeses of other companies. A very similar composition and taste have the "beech", "Kind": "violet", "Arla", "Almette" (although the latter is good for rolls because of the high fat). They are cheaper and found in most stores. You can find other cheeses, as long as it was soft curd cheese without additives. True gourmets say that nothing can replace the taste of "Philly" roll, and analogues of this cheese only spoil the product. What fish to choose for making rolls? Traditionally, the rolls are prepared from a sea or ocean fish, the river is rarely used. In Japan they eat raw fillet, very fresh fish without bones and skin, but in Russia such rolls cause suspicion, therefore, is used only salted, pickled or heat treated product. The most popular fish for sushi is salmon, coal, tuna, mackerel. The choice depends on the recipe, taste preferences and capabilities. Pickled or salted salmon to be sold everywhere, if you want you can find the eel to find in stores mackerel or tuna is more complicated. 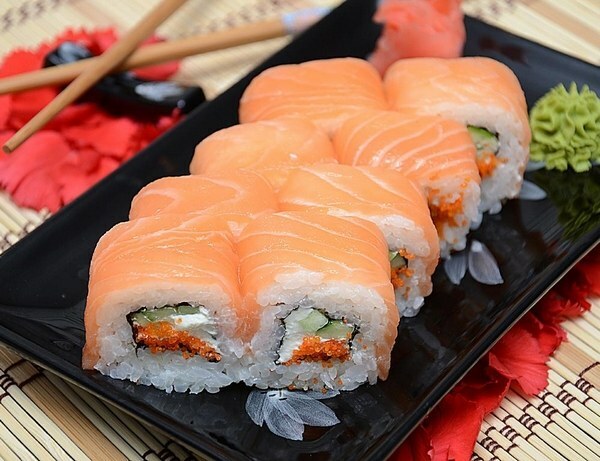 You can combine multiple types of fish to one recipe of rolls: for example, a variation of the "Philadelphia" involves the use of strips of salmon on top, and inside is placed a piece of eel or tuna. The most "Russified" recipes of rolls offered to put them in salted herring, canned fish – saury or sporty, but the taste will be significantly different from the usual Japanese dishes. Cheese compared with other dairy products can be stored for a very long time. Nevertheless, he did not avoid damage, if not to take additional measures. To extend the shelf life of cheese, it can be dried. In large volumes at the enterprises for the production of cheese cheese is dried in special drying installations. The most effective is vacuum drying of cheese in a microwave vacuum systems (IDD). Microwave waves are used in microwave vacuum systems - electromagnetic waves with a frequency of 2.45 GHz. Acting on cheese, they transfer their energy to moisture in the product, heat it and bring to a boil. Inside the product pressure is increased and the moisture vapor out, while leaving open the channels. Thus, drying occurs by evaporation of the liquid and ejection of pairs from the product of that part of the moisture which does not evaporate. This principle ensures super fast drying – 4 times faster than traditional drying. In a vacuum, the boiling point of the liquid is reduced to 10C, so the drying takes place without destruction of vitamins and proteins. The condensate formed in the process of drying the cheese in the IDP, and the smell comes in a special reception tank. This condensate cheese taste and smell can then be used as the reducing agent of dry cheese. If vacuum drying of the obtained two types of products: cheese powder and crispy cheese. Cheesehydrated powder has a pronounced cheese taste and smell, often augmented by various spices. It is used as a seasoning for various dishes, it has a lot of protein, and it can also be stored for a long time. Crispy cheese is a cheese sticks or beads with a porous structure. They are easy to break and crumble under light pressure. In addition to industrial production, cheeses are made at home. Methods of cooking jerky a great many. And if home-made cheese prepared for long term storage, it is also necessary to dry. Dried cheese cooked in summer in the shade outdoors, and indoors in the winter, but as far as possible from the furnace to cracked. Have them on the shelves or poles covered with straw. From time to time, it would appear on the surface of the mold, should be scraped with a knife and wash in salt water. Dried cheese you have to clean and scrape with a knife and fold in large pots, sprinkling of oat straw. Continue to keep cottage cheese is recommended not to dry but not in wet place. Then, the cheese will not dry out, and in the second case - not moldy and rot. 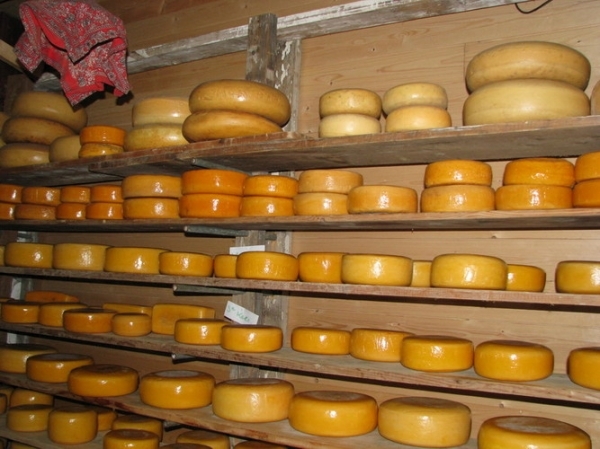 If the cheese is nevertheless covered with mold, it is necessary to wash the whey, add salt and again dry in the shade, turning from side to side. To raw yet the cheese did not touch the flies, it is better to dry it in baskets through which air easily passes. You can cover the mesh. In the drying process of cheese is often necessary to turn from side to side.